REPL since its inception has stressed over developing its advanced team of professionals who are capable of envisaging the design components and are capable of turning them into prototypes and finally into products. This team of professionals at REPL is further supported and helped by some of the most advanced and cutting-edge industry standard tools at their disposal. We license a healthy range of mechanical design software, which enable our team to deliver value, which is at par with any of our competitors in the market. The core of our owned software licenses in this category range from AutoCAD, CATIA, CAD, CAM, Forming suite to name a few among many others. We have also deployed network based design solutions as well which helps us collaborate with multiple teams located over multiple locations across the geography of our country thus allowing us to leverage multiple resources and multiple ideas at the same time to achieve concurrent goals and objectives. REPL – IV, which is also a DSIR approved R&D centre of the group houses an In-House tool room, which, develops and deploys tools as per the specific requirements of the organization and its collaborators. 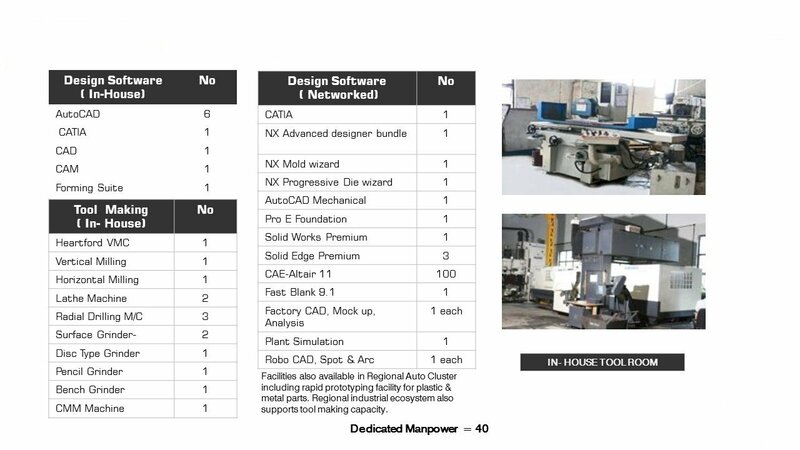 Loaded with latest tool making machines the centre is capable of CAD designing and converting those designs into working products. The centre houses VMCs, Horizontal Milling centres, Lathe Machines, Drilling Machines, Surface Grinder, CMMs and other different latest mechanical technology to turn prototypes into actual products. Copyright © 2018 Rucha Group. All rights reserved. | Rucha is a registered trademark of Rucha Group.